When it comes to sweet rolls, one of my favorite is the cinnamon rolls from Cinnabon. It’s a blend of perfect sweetness and softness. But instead of buying we can all save a lot of money by making our own homemade cinnamon rolls. Before trying to make it at home, I thought it was hard to make but I was wrong, not only was it super easy the taste is absolutely a winner. 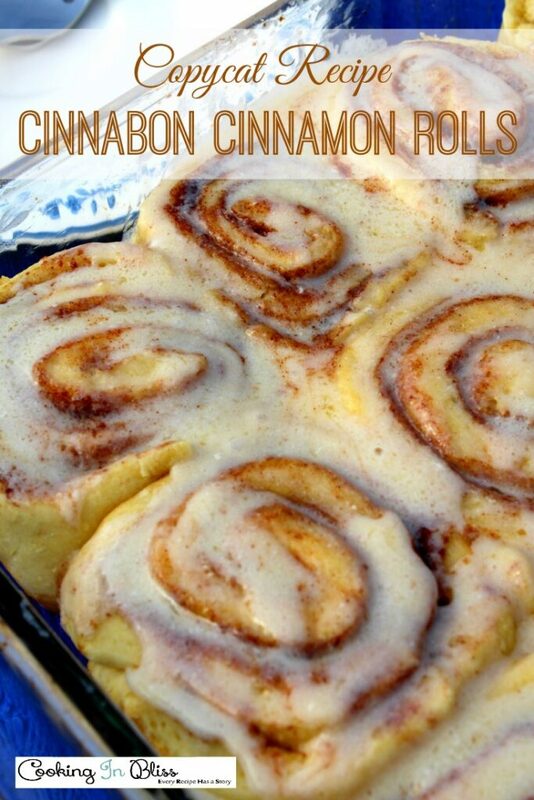 You’ll never know the difference of the real thing with this Cinnabon Cinnamon Rolls Copycat Recipe. It’s so delicious and perfect with coffee or tea. We love a great bread. I just can’t help it! This recipe came about because I made a pineapple cookie and it only used half the can of pineapples. I thought I bet I can put this into a bread and make it just divine. That is what we did. 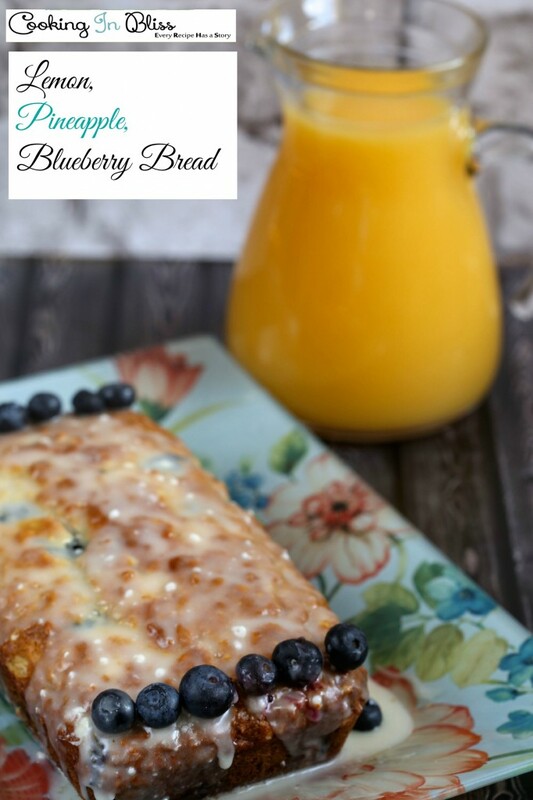 This is our pineapple blueberry cake. 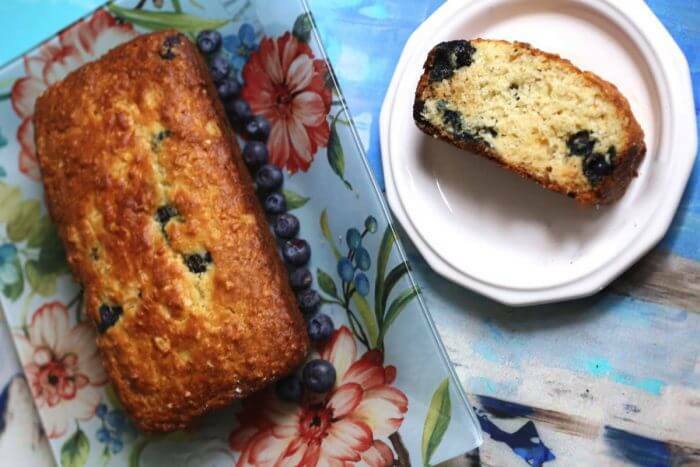 We have always loved the sweetness of a blueberry and the tart taste of a pineapple. The combination of the two in a bread is divine. I usually make muffins like this but my kids really enjoy a bread. 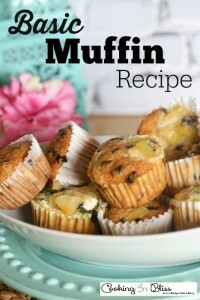 You can see my amazing basic muffin recipe that is a fan favorite in our home. You will combine all of the dry ingredients in one bowl. Then you will combine all the wet ingredients in another. 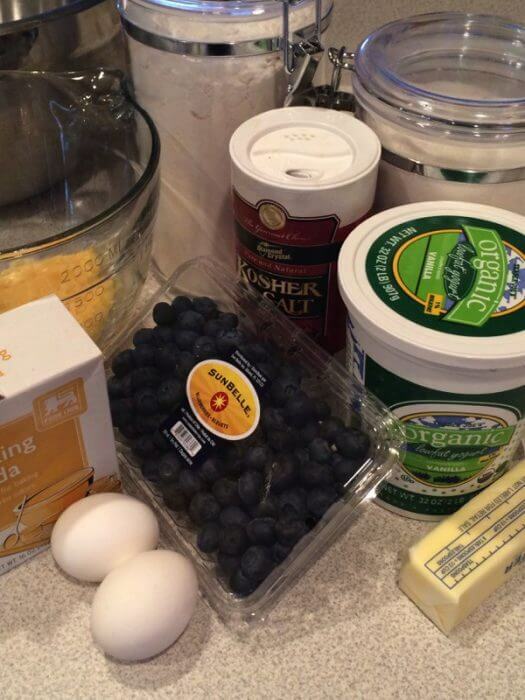 I leave the blueberries out until I have combined the dry ingredients with the wet ingredients. 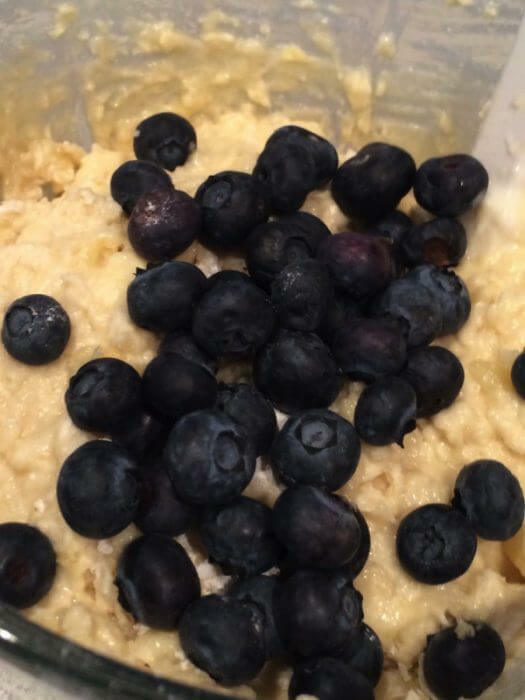 Then you add the blueberries. I always butter the loaf pan or spray them with cooking spray. The loaves will cook at 350 degrees for 45- 55 minutes or until they are golden brown. I let them cool and then I turn them oven to cool on the wire rack for the remaining time. I usually make the icing and apply it to half of the loaf and the other half I leave it off. 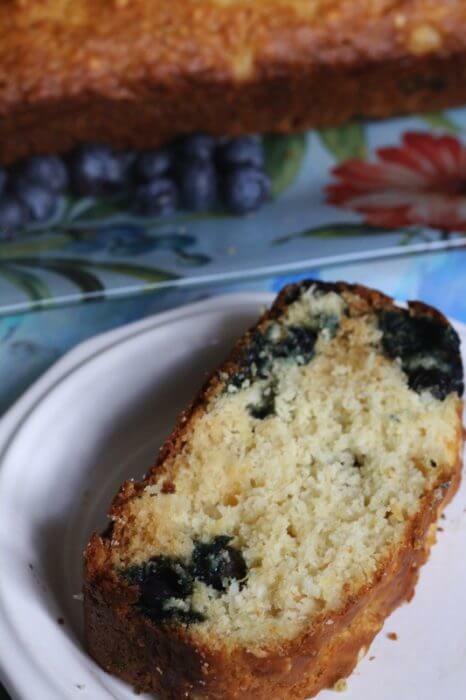 The is a great bread to grab on the run or a cake if you add the icing. 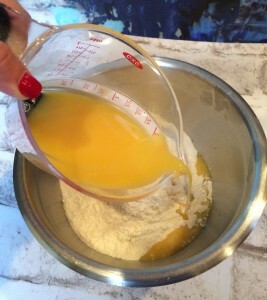 You will make the icing by melting the butter and adding in the wet ingredients. Then add in the sugar and let it set a little. You want to make sure when it pours it doesn’t run. 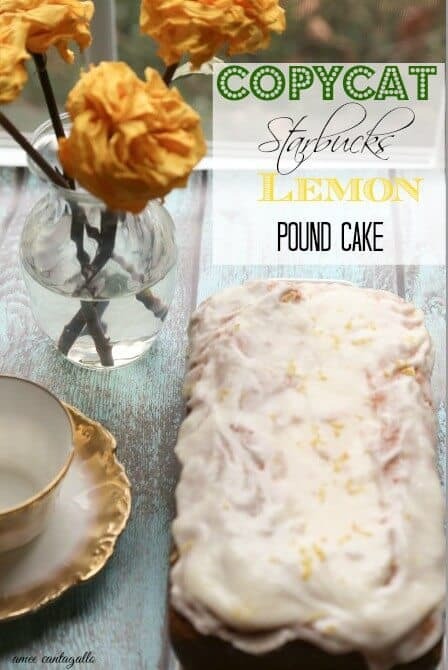 I use the lemon icing the I use on my Starbucks Lemon copy cat recipe. 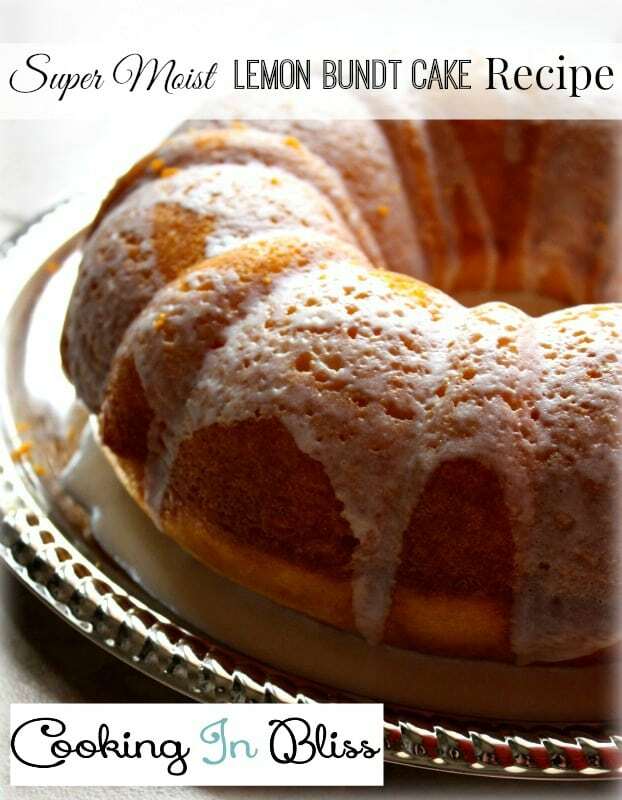 This is my favorite lemon pound cake recipe. We also have a fantastic moist lemon cake. I had champagne leftover and I decided why not make something out of it. 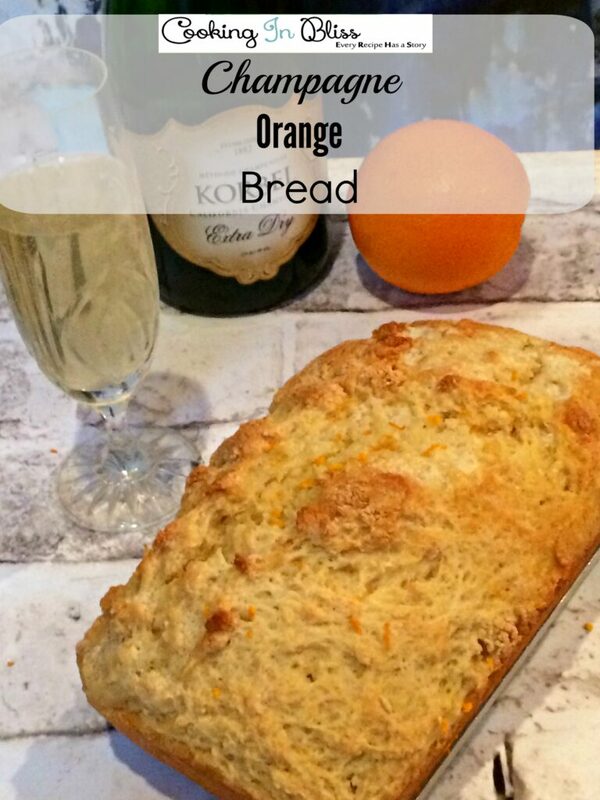 I looked over the Internet and I was lead to this great recipe for an orange and champagne bread. I decided to try it. 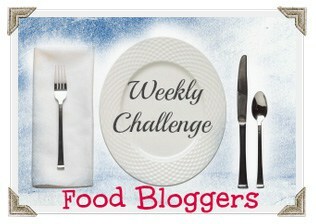 I was pleasantly surprised at how easy it is and how great it tasted. We served it with pasta but it would compliment a soup or salad. It could be paired with fruit and eggs for a fancy brunch. You will first mix together the dry ingredients . 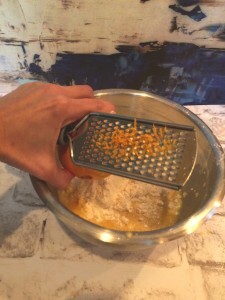 Then you grate in the orange peel. Finally, will mix in the wet ingredients. The bread will be a bit lumpy that is fine place. When you have mixed it you will place it in a greased loaf pan. You will cook it at 350 degrees for 50 minutes. Note: This recipe for the liquid can be substituted for a 12 oz beer or soda to change the flavor of the bread. It is an easy base for an awesome bread. 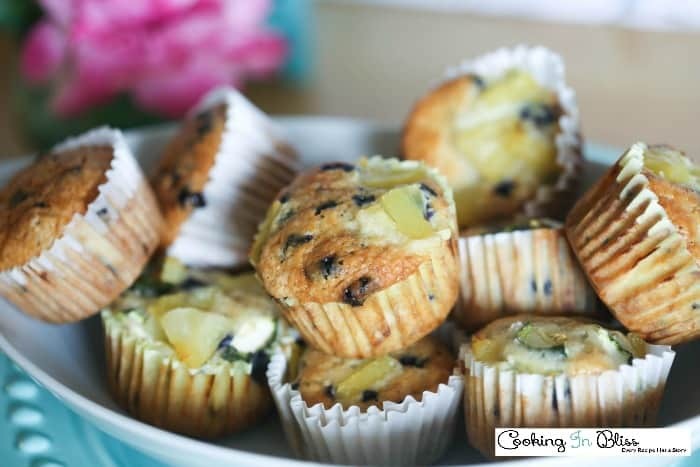 Do you love muffins? My family does and there’s no need to buy because it’s easy to make at home. 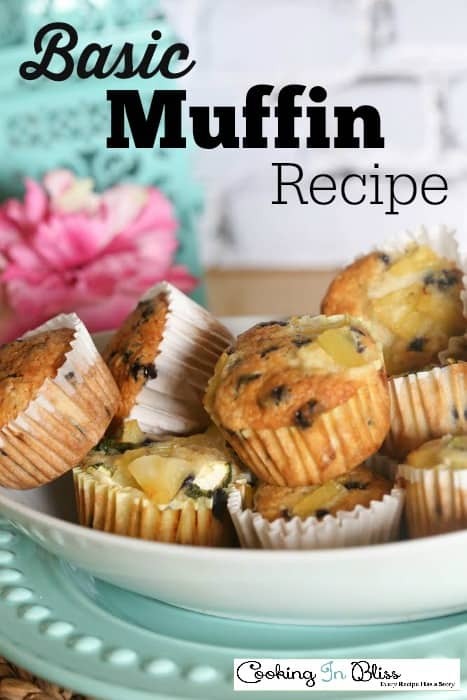 This Basic Muffin Recipe can be used as base for any muffin flavors that you like to make. Next fold the wet ingredients into the dry. You can use this base for almost all of your recipe needs. Then once everything was mixed, place the muffin mix in the cupcake papers in the muffin tin. Cook for 20 minutes at 350. 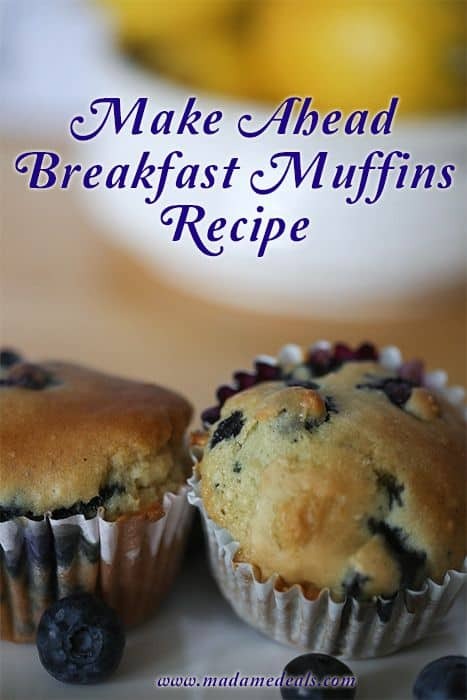 This basic muffin recipe yields a dozen muffins. You can add your own flavors to make these more fun. Like blueberry pineapple zucchini. I love, love, love me some hot cross buns. 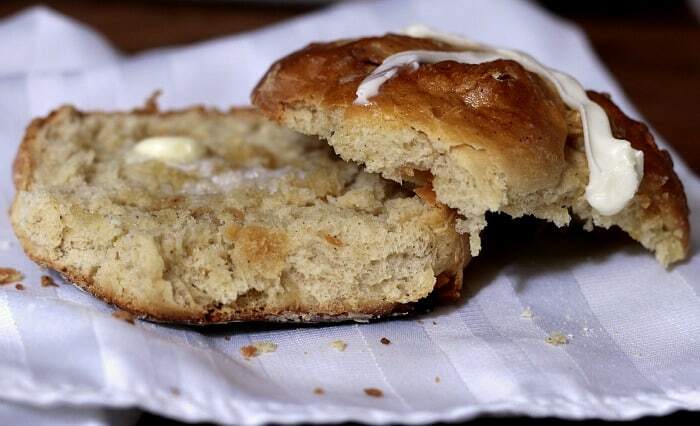 Waking up on Easter morning, running into the kitchen to see Hot Cross Buns in the oven was life altering. Something so simple and easy yet so irresistibly good – how could they not change lives?! Of course we always had them on Good Friday, but us kids didn’t really understand what that was. But boy, when we got tucked in and told we were having Hot Cross Buns in the morning it was like Christmas Eve. You remember that anticipation that kept you from closing your eyes for more than a few minutes at a time. I love that my son gets to embrace this tradition today, and I imagine he’ll share it with his children too. Or at least marry someone who will. 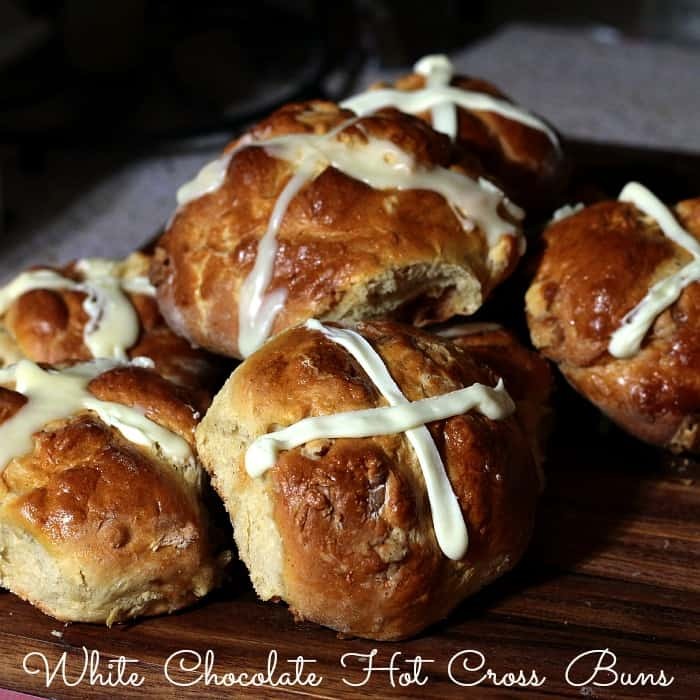 Everyone has their own way of making hot cross buns, and I’ve added a little twist to mine. My mom used to use raisins her mom used currants, I use white chocolate chips. Don’t judge me, they’re soo good! I make my Hot Cross Buns pretty big, but we like ’em big. Truth be told, they would probably bake better if they were smaller. We’ve never had enough leftovers to need to freeze them, but I imagine they would keep for a couple days at least. What do you think? 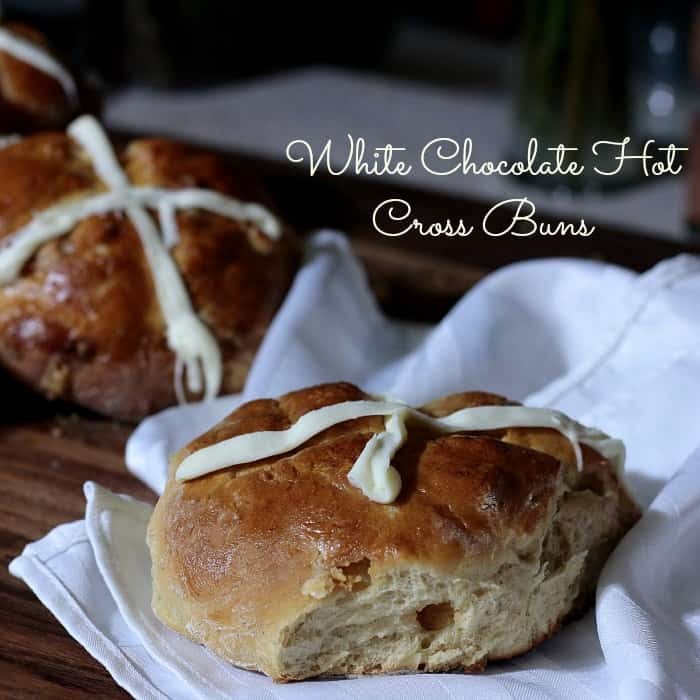 How do you like your Hot Cross Buns? Pour 1/2 cup of the warm milk into a small bowl. Add the yeast and allow it to bloom for 10 minutes. Whisk in the honey, 2 eggs, butter, pumpkin pie mix, salt and white chocolate chips. 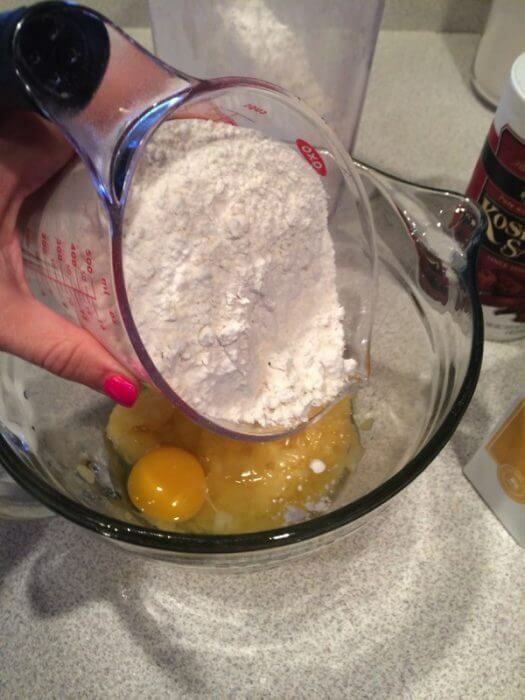 Mix in the flour, slowly. While mixing, carefully add the 1 cup of milk. Once the mixture is dough like, dump it onto a counter and knead 4 times. If it’s too sticky add a little flour to smooth it out. Cover with plastic wrap and allow to double in size; about 20 minutes. Lightly flour your work surface and place the dough on it. Pull off pieces about the size of a baseball (or your preferred size) and make them into balls. Place the balls on a parchment lined baking sheet. Continue until all the dough is used. Cover again with plastic wrap and preheat the oven to 350 degrees F. I like to sit my buns on the oven to rise while it’s preheating. This take between 10 and 15 minutes. Uncover the buns and cut crosses into the tops. Brush the tops with the beaten egg and bake for 20 minutes or until browned. To ice the tops I melted 1/2 cup of white chocolate chips and piped the crosses on with that. Yummy!